Well, I tried my hand at using Resin. Globecraft and Piccolo just released their new UV Resin product so I had to try it! I started small by first making a charm. It turned out pretty good for my first attempt and it really didn’t take long at all. 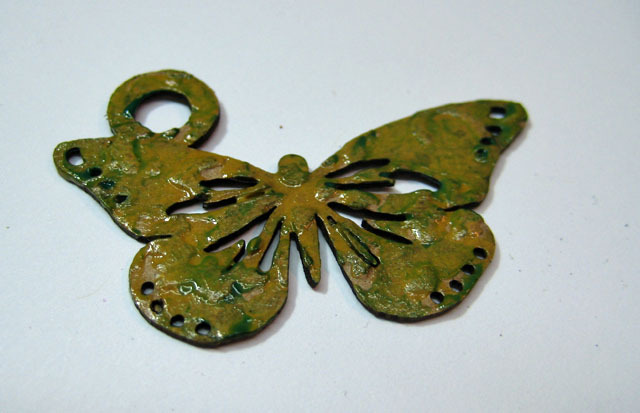 I started with a bookboard butterfly from the Butterfly Charm Set. I gave it some dimension by running it through my Vagabond in an embossing folder. I wanted some texture so the Piccolo 3D Enamel Gels would settle in the little cracks and crevices. I first applied Piccolo Yellow Ochre 3D Enamel Gel and spread it around with my finger. I spread this color around and let it set for a few minutes to dry. When you spread it thin with your fingers or brush it dries pretty quickly. 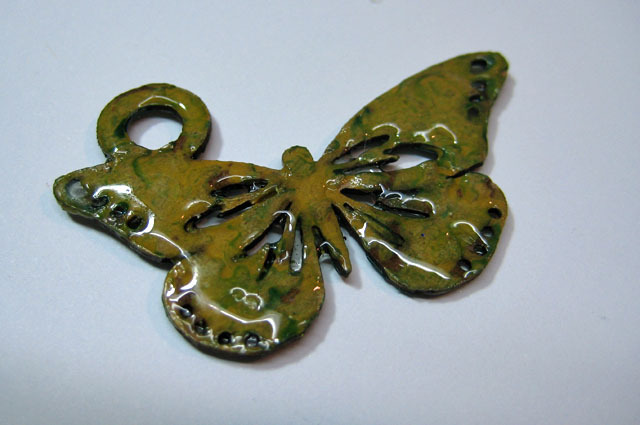 I then added my second color, which was Piccolo Dark Green 3D Enamel Gel. I did this to both sides and set it aside to dry thoroughly. Then I coated it with Piccolo UV Resin and placed it under a UV light to cure. It cured in under three minutes. 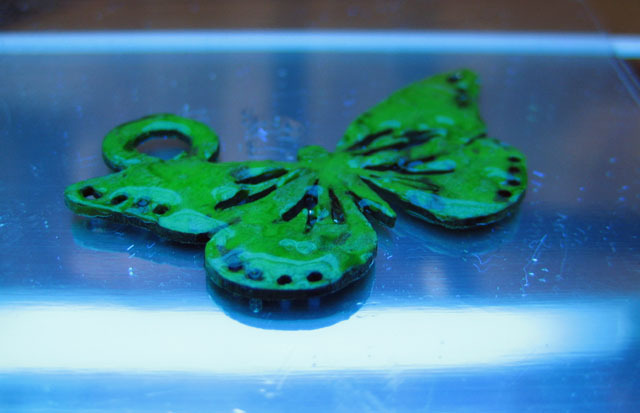 Then I coated the other side with the Resin and placed it back under the UV light. Once cured, the Resin protects the piece so it works great as a charm to hang from an altered book or, in this case, another DIY Ornament! 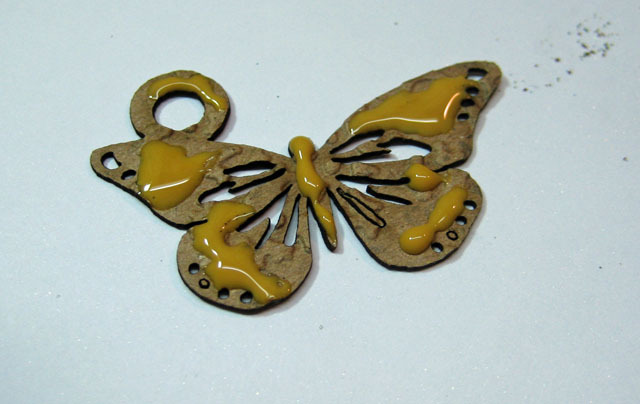 Check out the G&P Blog to see how I used this charm on a new DIY Ornament. Is the resin different from Glastique because it sets up so quickly? Looks interesting…. Yes, Sandy. It is different. It will cure with a UV Light in a matter of minutes or you can set it in direct light as well. I don’t think it is on the website store yet. I will find out more when I got there Sunday to demo and can let you know when it will be available. Hmm. Certainly would speed up an assembly line of globes if you didn’t have to wait for the Glastique to dry due to using the resin instead. Resin has same properties as the Glastique aside from needing the UV light? It’s actually better. More wear-n-tear hardy! As soon as we get ours in the store I’ll let you know! Cool. Can’t wait to try it!